Piaggio's brings iconic Vespa scooter back on Indian roads! Piaggio’s brings iconic Vespa scooter back on Indian roads! How would you feel if you saw Bajaj scooters zipping off on the road like yesteryears? Well, that isn’t really happening because Bajaj quit the scooter production segment 2 years back. But in a few months time you might just be able to witness the retro vintage scooters back on the roads because Piaggio has re launched Vespa after a 13 year hiatus from the Indian market. This time of course, in its singular capacity. The Vespa LX 125 is priced at Rs. 66,661 ex showroom in Maharashtra and it is aimed at the luxury end of the scooter market. And if the iconic history of the scooter is anything to go by, the Vespa will click with the urban Indian looking for a set of wheels that are trendy and chic. 2 What’s special about the Vespa? Folks from the era of Bajaj Chetak and LML Vespa will have a déjà vu because both these models took inspiration from the original Vespa’s styling. Vespa produced scooters in partnership with Bajaj Auto in the 1960s but that ended in 1971 as Indira Gandhi’s privatization programs came into place. In the 1980s, Vespa partnered with LML Motors in India to produce the famous P series scooters. This partnership ended in 1999 because of an irresolvable dispute. What’s special about the Vespa? There are tons of scooters in the Indian market available at affordable and reasonable prices. Then why would someone pay a 15-25% premium to buy the Vespa? The answer is simple. 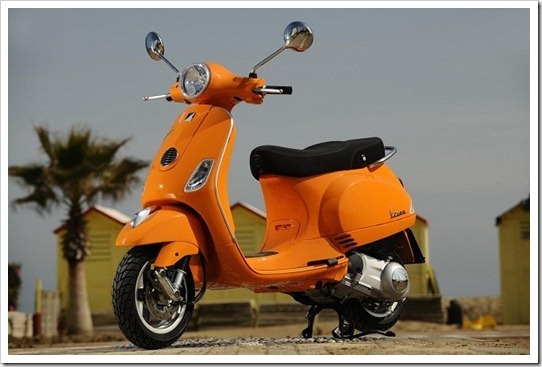 Vespa is a brand that resembles the 60s, vintage style, class and a design that has stood the test of time. Just like sporting a vintage styled Louis Vuitton suitcase is fashionable, riding this Italian wasp (Vespa means wasp in Italian) is all about oozing style and sophistication – a quality uniquely associated with everything Italian. LX 125 is the name of the Vespa model in India and it has a 125 cc gearless engine with variomatic transmission, trailing link front suspension, drum brakes and a unique single monocoque chassis. It has been tailored to be extremely fuel efficient. Vespa claims a fuel efficiency of 60 kmpl. This is nearly twice that of the current European Vespa models. The under-seat storage is large enough to fit a helmet and the glove box too has multiple storage units. The frame of the scooter is made of very light metal, making it very easy to twist and turn the scooter to maneuver it in Indian traffic jams. Piaggio is very optimistic about its re-entry in India. The company expects that its sales in India will cross its global sales across various markets within 2-3 years, reported ET. The Indian scooter market is pegged to grow at more than 20% compounded and Piaggio wants to grab a slice of this growth. AFP reported that more than 25 lakh scooters were sold in India in FY11-12 and the entire market segment grew by more than 20%. "We could not have launched Vespa at better time than this. The scooter market is fastest growing segment in the country and the Indian consumers has evolved today aspiring to own more lifestyle products and Vespa fits in perfectly." The key for all the foreign players to be successful in India is to show high levels of product adaptation to demographical taste. Maruti Suzuki went out of the way and designed its latest offering, Ertiga, in Japan, keeping Indian consumers in mind. Piaggio too, is leaving no stone unturned and has made a changes to the original European design to appeal India Inc. The shape of the seat has been changed to the needs of Indian women who prefer to saddle sideways while riding pillion on scooters. Keeping the Indian women happy, the LX 125 also has a slimmer body because Vespa thought it’d go well with the side-sitting position of the woman pillion rider. Considering that Indian women may wear saris while riding a scooter, the footboard has been lowered for more leg space. Considering Indian traffic, a louder horn has been given to the LX 125. No surprises here. Considering Indian driving conditions, Vespa has also tweaked the distance between the surface of the road to the engine of its scooter. Vespa claims that this modification will reduce the chances of damages due to bumps and pavements. The rear wheel ergonomics have been redesigned to make it easier for riders to change their tires in case of a puncture. Last but not the least, which scooter/bike company puts a price on their models which ends in a 1? Pricing the LX 125 at Rs. 66,661, Vespa seems to have understood that it takes more than just strategy to get it right in India Inc. It needs some good auspicious vibes too. So if you happen to be around Piaggio showroom, make sure you visit it and take a look at this little beauty! "Piaggio's brings iconic Vespa scooter back on Indian roads! ", 5 out of 5 based on 1 ratings. no doubt vespa is a renounced company but price of scooter is more then other companeis. Can somebody help me to find the vespa scooter dealer in kerala? can somebody help me to find the vespa scooter dealer in ahmedabad? Beauty,Lovely & Waiting for New Dealer In Delhi to purchase this Ultimate Scooter.I am Very Passionate about this Lovely Scooter . i like vespa scooter from my child hood. Thanks and good to know about Vespa! Very few people know about it. Rather I think that people from age 45-55 will more likely opt to buy this vehicle. Cheers!